For best viewing click any button below. PDF, HTML and word processor types DOC and SXW. You may wish to use the zoom or magnifier feature in your PDF reader. Set your PDF viewer to 100% if a picture appears 'blocky'. You may wish to use the Text size option found in the View menu of your browser to increase the text size. Note: The original line lengths have been left in the HTML files. Since the lines do not 'wrap', increasing the text size in your viewer will cause some lines to break short causing the next line to also be short. - then click (or doubleclick) on the file of your choice. The 18th Chapter is made available here because it documents the total failure of vaccination to achieve any improvement in public health. Later editions of this book have a 'modified' chapter 18 and thus if you search the used book market for the original, be sure to get the First Edition! Our copy was published 1898. Searches may be made within the following 2 files. Also text may be copy-and-pasted from these files. Please click a link above for the desired format. 123 pages have been excerpted from the book, The Wonderful Century. Because the Diagrams in the back of the book originally were on 13 inch fold out pages, some diagrams have been separated from the description accompanying the diagram making a total of 129 pages in our PDF and DOC files. In these cases, the descriptions will immediately proceed the diagram. If you wish to debunk the current propaganda about 'cowpus' being a preventative for smallpox, this is excellent source material. Each format listed above may be searched, copy-and-pasted or printed. If you suspect an error, refer to the PDF file that contains an image of each page. Philosophers, Statesmen, Philanthropists, Medical Men, Publicists, and others. This 32-page booklet contains 28 separate opinions, each printed on a half-size page. All opinions are adverse to COMPULSORY enforcement of vaccination and many are adverse to any vaccination. If you want to quote an able thinker who lived in the period of common smallpox epidemics, here is a delightful assortment of authoritative opinions. THE TALE OF THE 152 DEAD. by the Victoria Street Society for the Protection of Animals from Vivisection, United with the International Association for the Total Suppression of Vivisection. The first page of this PDF file is a clean version. The 5th page is a repeat of page 1, with a written note at the top stating that 186 had died by March '90. 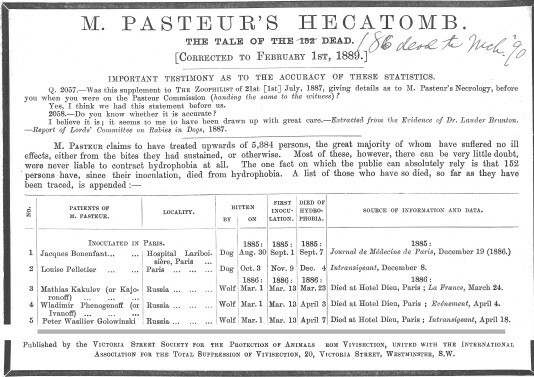 This scanned JPEG image file shows the fact that early Rabies treatments from Louis Pasteur were more deadly than the disease. Date        Time             File Size  File Name. Top of page 1 and End of page 4. The rest of the document is the 152 names of the dead. A magazine called The Nineteenth Century, printed in May of 1882, contained a 20-page article rebutting the practice of vaccination. 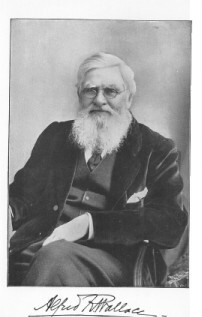 Quote, " Be this as it may, Dr. Carpenter's attack, made as it is by one who is universally recognised as the leading representative of vaccination, affords that opportunity for free and open discussion the lack of which has been, in my opinion, the only cause of the continued national faith in what I believe to be an exploded fallacy and a baseless superstition." This document is a 40 page pamphlet written a year before the Anti-Vaccination document above. This file has been added since the publication of our original "Archive II" CD. This valuable 33-page booklet, originally published by the National Anti-Vaccination League at a price of only Fourpence could have saved the U.S. government nearly a Billion dollars by avoiding the recent purchase of new stocks of 'cowpus' for smallpox vaccine. 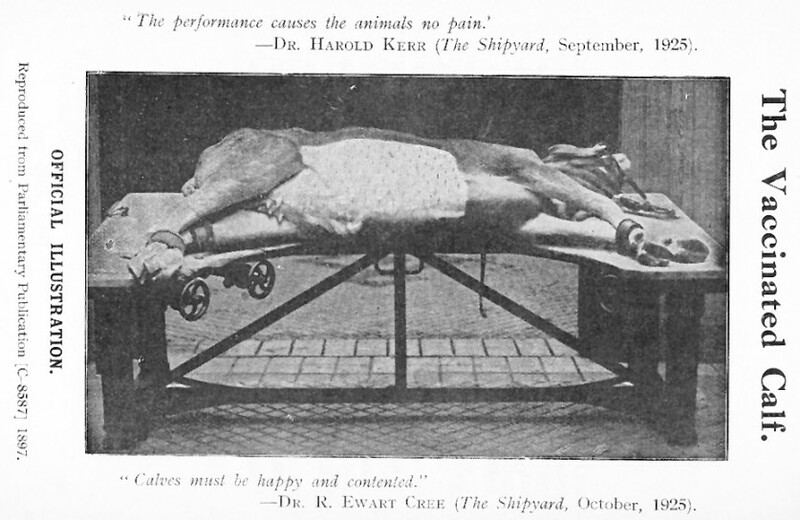 by E. R. Moras, M.D. Included here are 58 pages plus the Preface and title page of a book that includes a Volunteer-Letter to President Wilson during WWI and information on the Epidemic of "Spanish Influenza" of 1918 that could have saved vast numbers of people had the knowledge been applied. It is half a century since these incredible fliers were written by Duon Miller for Polio Prevention, Inc., in Coral Gables, Florida. While some statements might be modified in the light of today's knowledge about the contribution of persistent pesticides to polio, much remains that we can learn from and marvel at about the unscientific effort to prevent polio using vaccines. These files are PDF image files with the recognized text 'Under' so that you can copy-and-paste text. Some images do not contain recognized text so that 'copy-and-paste' will not be possible. Example: Some of the diagonal box text in murder.pdf. "CALIFORNIA CHILDREN DRINK POLIO-RASPBERRY MILKSHAKES"
WE MUST PREVENT POLIO TO OVERCOME IT!